With a new compound inspired by those found in MotoGP in addition to a raft of new features, the Michelin Power Competition tyre is the fastest tyre in the Michelin Power range. 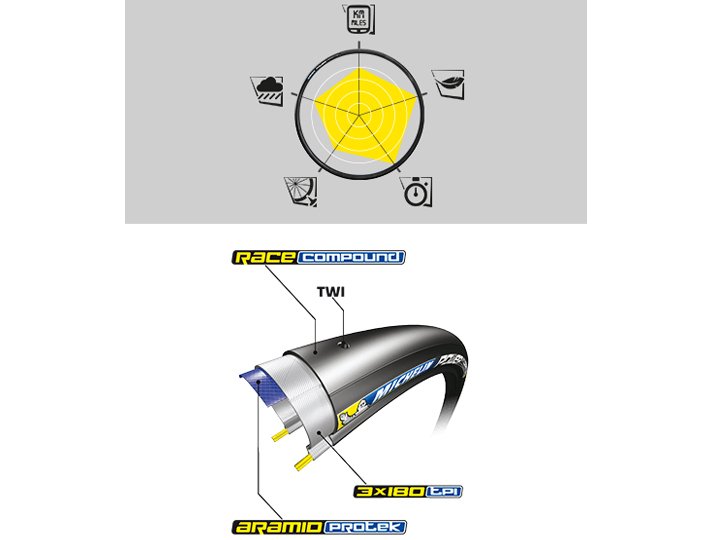 Replacing the Michelin Pro4 Service Course tyre, Michelin claims the Power Competition will provide a 10-Watt advantage, equating to a minute and 25 seconds gained over 40 km at 35 km/h, with a 25% reduction in rolling resistance. Michelin's team of product developers and testers focused on rolling resistance, grip and puncture resistance, with a view to ensuring even longer tyre life. They tested the range in a number of ways - in the lab, testing using in-house machines and independent agencies and subjective and objective testing on vehicles, in addition to testing by customers. The new range also stands out for the unrivalled performance it delivers thanks to some major innovations and through the fact that it was engineered to meet the demands of the most exacting cyclists.